CHICAGO (AP) — With the wind blowing out on a warm Saturday at Wrigley Field, the San Diego Padres and Chicago Cubs appeared to be headed for a wild finish. 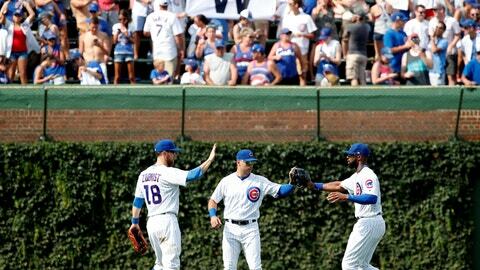 Then Chicago’s bullpen took over. Steve Cishek, Brandon Kintzler and Pedro Strop combined for 3 1/3 perfect innings in relief of Kyle Hendricks, and the Cubs held off the Padres for a 5-4 win. Cishek replaced Hendricks after Austin Hedges’ sacrifice fly trimmed Chicago’s lead to 5-4 with two out in the sixth. With a runner on third, Cishek retired Freddy Galvis on a grounder to second. Cishek then worked the seventh and Brandon Kintzler got three outs before Strop earned his seventh save. Rizzo and Kyle Schwarber homered during Chicago’s five-run second inning. Jason Heyward added three hits and drove in a run for the NL Central leaders. Hendricks (8-9) allowed five hits, struck out seven and walked none in his second straight win. San Diego became the first team in the NL with 70 losses. Hedges homered for the second straight day, and Manuel Margot doubled in a run. Padres right-hander Walker Lockett (0-2) allowed five runs and nine hits in five innings. Lockett started in place of Joey Lucchesi, who was scratched on Friday because of an illness. Lucchesi was able to do his pregame work on Saturday and was sent back to the team hotel as a precaution. The left-hander is expected to start on Sunday. Schwarber led off the big second with his 20th homer. Addison Russell added a two-out RBI single and Rizzo followed with a drive to center for his 17th of the season, making it 4-0 Cubs. Heyward capped the five-run burst with an RBI single. “I just let the game speed up on me a little bit on me and got a little fast out there,” said Lockett, who was making his second start and third major league appearance. San Diego was hitless before closing the gap with a three-run fourth. Travis Jankowski led off with a bunt single, advanced to second on Hendricks’ throwing error and scored on Margot’s double. Renfroe hit a sacrifice fly with one out before Hedges connected for his eighth homer. The Padres put outfielder Wil Myers on the 10-day disabled list with a left foot bone bruise. The move is retroactive to Friday. Outfielder Franmil Reyes was recalled from Triple-A El Paso. Reyes has played 38 games for the Padres this season, batting .221 with six homers and eight RBIs in 104 at-bats. This is Myers’ third stint on the DL this season. “There’s a good amount of swelling still in there, but hopefully, in three to five days I’ll turn the corner and start putting pressure on it again,” he said. Strop had an easy 12-pitch outing after struggling through 26 pitches and giving up two runs on Friday. He got the save after the potential tying run was thrown out at the plate in another 5-4 win for the Cubs. Cubs: RHP Yu Darvish (triceps and elbow injuries) threw a 55-pitch bullpen session. He said he was pain-free and “very optimistic” about returning to the rotation. He has made just eight starts this season and last pitched on May 20. Cubs ace Jon Lester (12-4, 3.22 ERA) looks to bounce back from a recent rough stretch in the finale of the four-game series. The left-hander is 0-2 with a 7.07 ERA in his last three starts. Lucchesi (5-6, 3.74 ERA) goes for the Padres.